– Buddha of Sukhavati (a Pure Land). – Buddha of Infinite Light and Life. – Literally ‘Foe-Destroyer’ in Sanskrit and it denotes a highly attained spiritual practitioner. – Prominent Indian Buddhist Saint of the 11th Century who was instrumental in spreading Buddhism in Tibet. – Buddha of Compassion. Also known as Chenrezig (Tibetan) and Kuan Yin (Chinese). – Divine beings sometimes known as celestial dancers. – Divine beings or Demi-Gods; a class of deities of the lower ranks who are often not pious in nature. However, not all asuras are evil. – An ordained man; monk. – It means a ‘mind of Enlightenment’ and generally refers to the determination to attain Enlightenment to liberate all living beings from the painful chains of delusion. – A being who has achieved Bodhicitta but has not yet attained full Enlightenment and it also refers to an enlightened Being who keeps returning into our world to show us the path to happiness. – Hindu god of creation. – The Awakened One. The term “Buddha” refers to all Beings that have attained full Enlightenment. – The teachings of the Buddha. - “The Awakened One”. The Buddha manifested the possibility of achieving full Enlightenment in the human realm. Born as Siddharta Gautama 2,600 years ago, He taught the methods to achieve the same state of Enlightenment which he himself had achieved. During his lifetime, many members of his Sangha achieved Enlightenment. – Traditionally, candles in Tibet were made of yak butter. As butter was quite hard to obtain, offering butterlamps on the altar was considered a very precious offering. Nowadays, we may offer candles but the traditional containers which hold the candles are still referred to as butterlamps. – A Sanskrit word meaning wheel. Chakras are said to be dynamic circular ‘wheels’ of energy at certain points on the physical body. - Protective talismans or amulets. – A seventh century Indian Buddhist philosopher who wrote a commentary on Nagarjuna’s “Fundamental Verses on the Middle Way” entitled “Clear Words”. This is one of the most important works in the Mahayana Buddhist canon. – Literally, “Sky Walkers” or “Sky Go-ers” in Tibetan. Dakinis refer to enlightened, celestial Beings and highly spiritual women. – Wrong views adhering to beliefs which contradict reality or the true nature of existence. – Sanskrit for god, deity or celestial being. Devas are still in samsara. – Right conduct: seeing, thinking, feeling, speaking and acting in ways conducive to lasting happiness, as propagated in the teachings of Buddha Shakyamuni. Dharma does not refer just to Buddhist teachings but emphasises right conduct or a right path for attaining permanent happiness for ourselves and others. – Protectors are celestial beings that emanate in a form that specifically helps to clear obstacles to our spiritual practice. – Sphere of ultimate reality. – In a Buddhist context, this is a highly developed method of assessing someone’s karmic situation and receiving beneficial advice directly from enlightened Beings. – Buddha of Generosity and Inner and Outer Wealth (physical, financial wealth and spiritual growth). – An ancient mind transformation prayer. - The desire to encounter pleasure, material gain, praise and fine reputation; and the desire to avoid pain,material loss, blame and bad reputation. – Enlightenment refers to a state of mind that exists completely from compassion and wisdom, and is totally free of the negative delusions arising from anger, desire and ignorance. – Founded by Lama Tsongkhapa in the 15th century, this monastery has relocated from Tibet to South India in 1959 and is still one of the most illustrious Buddhist monasteries in the world. – Male nature spirits; spirits of the air, forests and mountains. Sometimes known as celestial musicians. – The school of Buddhism in Tibet which arose from Tsongkhapa’s teachings. There are three other main schools of Buddhism in Tibet: Nyingma, Sakya and Kagyu. – A higher Tantric deity like Yamantaka and his name literally means “secret assembly”. – Spiritual teacher, mentor and friend. The one who can free our enlightened potential, who can destroy our destructive self-concepts and uncover our naturally clear and compassionate true mode of being. Also referred to as “Lama” in Tibetan. – Having great faith in, and commitment and loyalty to one’s Guru. We submit ourselves fully to his teachings and carry out his instructions, with the understanding that this relationship will bring us all the way to Enlightenment. - A tantric form of the Buddha Avalokiteshvara. Vajrayogini is the female emanation of the Buddha Heruka. Vajrayogini and Heruka are both manifestations of the same enlightened mind (see also Vajrayogini). - A Buddha, whose meditations are of the highest yoga Tantra and the embodiment of great bliss and emptiness. He is dark blue in colour and has four faces and twelve arms. He is seen embracing Vajrayogini. – Another higher Tantric deity that is similar to Guhyasamaja. – Ignorance in Buddhist teachings does not refer to what is commonly regarded as “stupidity”. It is a term used to describe our clinging onto limited and often false concepts which lead to develop strong aversions and attachments. This, in turn, leads to engaging in actions that bring us unhappiness. – Is a Sanskrit word which literally means ‘lesser’ vehicle. It is one of the three vehicles, paths or scopes of Buddhism, the others being Mahayana and Vajrayana. It is a conservative school of Buddhism which focuses solely on the Pali scriptures and the non-theistic ideal of self purification to Enlightenment. – The King of the gods or Lord of the Devas; also the Hindu god of war. – The empowerment and permission to engage in certain advanced religious practices. – Literally, “action” in Sanskrit. Karma refers to the universal law of cause and effect. This suggests that all positive, negative and neutral actions of our body, speech and mind will have a corresponding reaction. - The school of Buddhism that was established by Dromtonpa based on Atisha’s teachings. – One of the 4 main schools of Tibetan Buddhism. Its lineage can be traced to Marpa, the Tibetan translator and the founding father of this tradition. – Followers of the Kagyu school of Buddhism, which stems from the teachings of Marpa Chokyi Lodoe (1012-1099). Renowned lineage holders include Milarepa and Gampopa. – A Buddha, whose meditations are of the highest yoga Tantra. He represents the full omniscience of the Buddha. The deity has twenty-four arms and is seen embracing his consort. – An emanation of Manjushri. Kalarupa’s practice helps us to destroy ignorance and develop wisdom to overcome our anger and suffering. He is also known as the special Protector of Yamantaka practitioners. - 108 volumes of scriptures that contain the teachings spoken by Buddha Shakyamuni himself. - Literally, “action” in Sanskrit. Karma refers to the universal law of cause and effect. This suggests that all positive, negative and neutral actions of our body, speech and mind will have a corresponding reaction. – The Buddha field, or Heaven, of Vajrayogini, after which H.E. 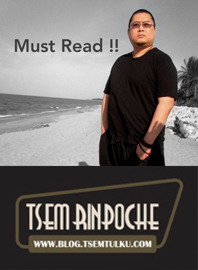 Tsem Rinpoche’s centre is named. – It is a Tibetan custom to offer a white silk scarf to our Gurus, elders or anyone held in high esteem, as a symbolic representation of respect to them. Khatas also symbolise prayers which we offer to the Gurus or Buddhas. – Tibetan for Guru (see Guru). – One of Buddhism’s most prominent enlightened Masters from the 14th Century, who was especially known for his ardent study, practice and teaching of the Dharma. Lama Tsongkhapa fully embodies three great Bodhisattvas – Avalokiteshvara (Buddha of Compassion), Manjushri (Buddha of Wisdom) and Vajrapani (Buddha of Spiritual Power). – Teachings and practices transmitted from teachers to students who can themselves become teachers when they have mastered what they have learned. In this way, the stream of wisdom and blessing passes unbroken through time from Guru to disciple. – The animal, spirit and hell realms. – Literally “The Great Black One”. A wrathful Buddhist Protector deity. There are over 70 different forms of Mahakalas; one of the best known ones has six arms and is a manifestation of Avalokiteshvara. There is also a four-armed and four-faced form that is a manifestation of Manjushri. – Literally “The Great Vehicle”. It is one of the two main divisions of Buddhism, the other being Hinayana. Mahayana practitioners’ motivation for following the Dharma path is principally their intense wish for all sentient beings to be liberated from the sufferings of cyclic existence and to attain Buddhahood. – A great Pandit (see Pandit). – Supremely attained Being. Highly-realised practitioners who are often known to manifest unconventional methods to inspire and awaken others to their enlightened potential. – Is the next Buddha to come. The scriptures say that he will only appear when Buddhism as taught by Buddha Shakyamuni has become completely non-existent in the world, which is around 5,000 years after Shakyamuni’s passing into clear light. In the meantime, Maitreya resides in Tushita or Gaden heaven teaching the Dharma to all those who ascend to his Pure Land. – A string of prayer beads, similar to a rosary. It usually consists of 108 beads, made from various materials and assists in the counting of mantra recitations (See Mantras). – A symbolic representation of a Buddha’s abode or of the universe. To make a mandala offering to the Buddhas is to offer up all that is precious within the universe, and all of one’s attachments and aversions, thereby letting go of them. This offering is a very powerful way of accumulating merit. – The ‘circle of power’ of a Buddha/deity, the energy field of a particular Buddha that always surrounds him/her and can be felt in pure practice. - A bodhisattva student of Buddha Shakyamuni that is known as Jampal Yang in Tibetan or Wen Shu in Chinese. He embodies the wisdom of all the Buddhas. – Prayers that are the spiritual energy of the Buddhas in the form of sound. Reciting mantras evokes the energy of the Buddhas. – The result of a positive action done without personal motive. The beneficial energy gained in this way will not be exhausted but propels us further on our spiritual path. – Lama Tsongkhapa’s mantra which invokes the three Bodhisattvas he embodies: Avalokiteshvara (Buddha of Compassion), Manjushri (Buddha of Wisdom) and Vajrapani (Buddha of Spiritual Power). (See also Lama Tsongkhapa). – One of the most well known Buddhist saints of the Kagyu lineage who achieved Buddhahood in one lifetime after much purification under his Guru, Marpa Lotsawa. – Hand gestures used in ritual practice, corresponding to the flow of subtle energies activated in spiritual practice. – Dragon or snake-like deities. – A second century Indian Buddhist philosopher who founded the Madhyamaka School of Buddhist philosophy. He was prophesied by Buddha Shakyamuni as the one who would come to clear up confusion regarding the Buddhadharma. One day, while he was seated by a lake, a naga arose from the depths and invited him to teach the serpentine water spirits. As a parting gift, they presented him with the twelve volumes known as the Prajnaparamita Sutra. – Also known as Ushnisha Vijaya, is one of the three Long-Life Deities, the other two being Amitayus and White Tara. She is white in colour and has 3 faces, white, yellow and blue. Her faces have peaceful, semi-wrathful and wrathful demeanours. She has eight arms, each holding different implements and sits in the meditative position on a lotus. She bestows longevity on beings for the purposes of attaining Enlightenment and benefiting others. – Permission and empowerment for recitation practice which is passed from Guru to disciple. – We make offerings of the best materials we can afford to the Three Jewels as a way to collect merit to support our spiritual practice. By making offerings to an enlightened Being, we are effectively making a prayer to attain the qualities they embody. Examples of offerings are flowers, light (candles), incense, water, food, or precious items like silver or jewels, etc. – One of the main Protectors of Tibetan Buddhism and the main Protector of Tibet. She is the personal Protector of the Dalai Lamas and the Panchen Lamas and is especially venerated by the Gelugpa practitioners. – A learned scholar and teacher of Buddhism, who is especially skilled and knowledgeable in the fields of logic and philosophy. – Also known as the Six Perfections. Enlightened qualities that help us to progress in our spiritual practice and eventually attain liberation from suffering: Generosity, Patience, Joyous Effort, Ethics, Meditative Concentration and Wisdom. 1.The outward practice of making offerings, prayers, prostrations etc. to the Buddhas as a way of connecting to the enlightened mind. 2. The inner practice of transforming negative, harmful qualities (anger, jealousy, greed etc.) into positive, enlightened qualities (patience, kindness, generosity etc.). – A text presented by Nagarjuna, a second century Indian Buddhist philosopher who founded the Madhyamaka. School of Buddhist philosophy. This seminal text contains the profound teachings on ‘Shunyata’ or ‘Emptiness’ as it was taught by Buddha Shakyamuni. The text was hidden away in the mysterious Naga realm only to be rediscovered by Nagarjuna. – A purification practice which can involve half or full-length prostrations, depending on which Buddhist tradition we follow. Prostrations purify harmful actions of the body and encourages the practice of humility. – Ritual set of prayers and offerings, which clear obstacles and invite Blessings from enlightened beings. – The celestial abode, or heaven, of a particular Buddha. The realms are actually physical manifestations of the Buddhas. Beings reborn in pure lands receive Dharma teachings directly from the Buddhas until they become enlightened. – Submitting oneself fully with total faith and trust to one’s Guru and to the power of the Three Jewels to teach and help us traverse the path to Enlightenment. – Meaning “greatly precious one” in Tibetan. Respectful and loving way to address a highly attained spiritual teacher. – A collection of prayers and mantras which are recited on a regular, daily basis and which help transform our lives by cutting away negative states of mind and developing enlightened qualities. – Is known as the ‘red hat’ sect of Tibetan Buddhism. It was developed by Drogmi, who studied under Naropa amongst other great masters. Renowned holders of the lineage are Buton Rinchen Drub and Gorampa Sonam Senge. – The sacred bond and commitment to one’s spiritual teacher, based on strong faith, devotion and effort. With this commitment, we are propelled forward exponentially in the spiritual practices and work we do. – The six realms of conditioned cyclic existence consisting of the three lower realms: hell, spirits and animals, and the three higher realms: humans, demi-gods and gods. Each realm has its more or less intense degree of suffering; the human realm is considered most suitable for spiritual practice. Mahayana Buddhists strive to achieve the ultimate goal of Enlightenment in order to liberate all sentient beings from samsaric existence. The cycle of existence where sentient beings continue to create and experience their own sufferings lifetime after lifetime. – The community of monks and nuns. On an absolute level, this refers to the field of all enlightened Beings. – The mind that regards itself as wholly important and puts itself first. It is a mind that views itself as independently existing, and therefore reacts to protect and look after itself exclusively, disregarding the needs of all those around it. – The revered abbot of Vikramashila University, who was one of the pioneers of Tibetan Buddhism in the Eighth Century. He was an Indian master who fused two major Mahayana schools, the Madhyamaka (Middle Way School) and the Yogachara (Mind-Only School) into a single logical and consistent system. - (560 – 478 B.C.) “the Awakened One”. The Buddha manifested the possibility of achieving full Enlightenment in the human realm. Born as Siddharta Gautama 2,500 years ago, he taught the methods to achieve the same state of Enlightenment which he himself had achieved. During his lifetime, many members of his Sangha achieved Enlightenment. – One of the primary and most widely propitiated deities of Hinduism. Often referred to as the God of Destruction. – Conventional and ultimate – emptiness, the realisation of the absence of inherent existence. – Literally means perfection, accomplishment or attainment. It is also used as a term for spiritual power or supernatural abilities, such as clairvoyance. – 7th Century King of Tibet during the Tubo dynasty. Influenced by his two wives, Princess Wen Cheng from China and Princess Brikuti from Nepal, he converted to Buddhism which he propagated widely throughout Tibet. Attributed with the dawn of Tibetan civilisation, he established the Tibetan script still used today, as well as the first laws of Tibet. – Symbol of a Buddha’s mind, also known as pagoda. Literally, it is a structure which contains sacred relics. It can be a building or a small representation which is placed on the right side of our altar. Seeing a stupa, which represents the five elements in their purified aspect, blesses our mind. – Scriptures of the Buddhist cannon, many of which are direct teachings of Buddha Shakyamuni. – The practice of taking the result onto the path where we identify with and work directly with the energies of an enlightened Being, instead of our limited concepts of ourselves. Tantra is practised by the most advanced, sincere and committed practitioners. – A great female Buddha who manifests in 21 forms. She is most commonly known in her manifestation as Green Tara who embodies Enlightened Activity and who is extremely swift in aiding and answering prayers. – Traditional Tibetan Buddhist paintings, usually of a Buddhist deity or master, used generally for veneration on altars, and specifically as a visualisation aid in meditation and Yidam practice. – The Buddha, Dharma and Sangha. - Proponent of nihilistic and other extreme philosophical schools of thought in India that were opposed to Buddhism. – Ritual “cake” offered to our Yidam. – Literally, “Emanation Body” in Tibetan. The title refers to highly attained Beings who have the power to emanate and reincarnate at will, and who have full control of their death and rebirth. – Ritual implement used in tantric practices. It is also a Sanskrit word which means “diamond-like”. – An emanation of Buddha Shakyamuni (see also Buddha Shakyamuni). – The “Great Vehicle”, referring to the highest, and often secret, set of practices and teachings in Buddhism. Vajrayana Buddhism is also referred to as Tantric Buddhism. (See also Tantra). – Literally, “Diamond lady ”. Vajrayogini is considered a tantric Buddha, whose practice is extremely swift and efficacious for attaining Enlightenment. There are different forms of Vajrayogini but they are all of the same enlightened mind. – The monastic, disciplinary rules for monastics. 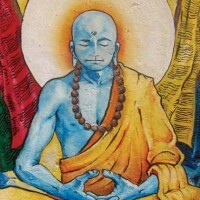 – An ancient meditation technique dating back to Buddha. – Is often praised as the mother of all Buddhas. She heals and blesses and averts grave dangers by the power of pacification.Throughout India, Tibet, China and Japan, White Tara is famous for granting long life and averting life-threatening situations. – Buddha Manjushri in a fierce tantric form. ‘Yama’ means the God of Death and ‘antaka’ means ‘terminator’. He has thirty-four arms, sixteen legs and nine heads, the principal head being that of a buffalo. His practice can cut off the roots of the strongest greed, anger and hatred. – A meditational deity (such as Tsongkhapa, Manjushri or Saraswati) whom practitioners concentrate their prayers and practice on. – The King of Death. – A meditational deity (such as Tsongkhapa, Manjushri or Saraswati). – A female spiritual practitioner. (Male spiritual practitioners are known as Yogis or Yogins).